Kate Marshall is the author of the Young Adult novel I AM STILL ALIVE (Viking Children's), coming in 2018. Her science fiction and fantasy fiction has appeared in Beneath Ceaseless Skies, Crossed Genres, and elsewhere. 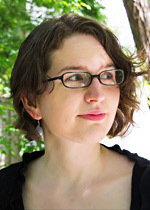 She writes historical romance as Kathleen Kimmel, and works in the video game industry as a writer and occasional designer. Her love of books runs through every aspect of her career; she serves as both a developmental editor and a cover designer for fellow authors. She lives outside of Seattle with her husband, a dog named Vonnegut, a cat named after a cylon, and a baby. They all conspire to keep her on her toes.